Be Mindful Online is a web-based course for teaching the skills of mindfulness. 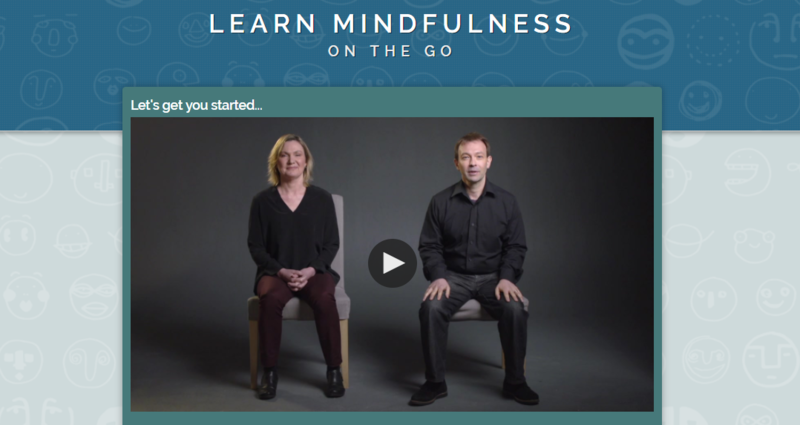 The 4-week course begins with a short introductory video led by the two mindfulness trainers. The program then leads the user through a stress assessment with personalized feedback, which is also administered at the end of the course. Be Mindful Online includes 10 sessions with different themes (e.g., Stepping Out of Automatic Pilot, Dealing with Barriers, etc.). Each session takes about 30 minutes to complete and is comprised of short instructive videos followed by assignments to be practiced between sessions (e.g., “eat at least one meal mindfully”). Some between-session assignments require an audio track, which is provided by the program for users to download and listen to on their own time (e.g., 30-minute-long “body scan”). A private diary accompanies users throughout the course and allows them to document thoughts and feelings. To encourage users to practice and complete the previous session’s assignments before moving forward, the next session only becomes available a few days after the user has completed the previous session. The program also sends emails to support and encourage ongoing practice. There is no time limit for completing the course, and users can complete the sessions at their own pace. Be Mindful Online is mostly suitable for users who would like to learn mindfulness and are willing to spend around 30 minutes per session along with continuous practice. The course’s design is suited for beginners in the way that it is gradual and appropriately stepped – leading users through the steps. It is professionally delivered, and the pre and post assessments enable users to retrospectively observe the program’s effectiveness. The program is a comprehensive mindfulness tool, focused on the thorough teaching of the principles and skills required for mindfulness practice. On the down side, for a video/audio-based course, the tone of the narration seems somewhat technical, unlike most mindfulness instruction. In addition, the program’s content is displayed in a way that makes it difficult to navigate back and forth within each session. Be Mindful Online could be recommended as a supplement to treatment for patients with no mindfulness experience who could benefit from the practice, provided they have sufficient energy – for example, those dealing with mild disorders – and motivation. Consequently, the program is not recommended for patients who are dealing with moderate to severe psychiatric conditions.